I just returned from Desiring God’s Bethlehem 2016 Conference for Pastors and Church Leaders in Minneapolis, and I’m still processing all the great content I heard. There were so many great messages from pastors and teachers such as John Piper, D. A. Carson, Jen Wilkin, and Kathleen Neilson. I stare at my blinking cursor trying to decide how to put into words all that’s swirling through my head at this moment. You know how they say some things feel as if you’re drinking out of a fire hydrant? I totally get it. This is how I felt as I soaked in nine sessions from eight speakers in a span of forty-eight hours. It really was like trying to keep up with the blast from a fire hydrant. And it was overwhelmingly wonderful. One week prior, I wasn’t even aware of this conference, much less that I would be in attendance. But how grateful I am that my friend persuaded me to go with her. I went hoping to be fed and refueled and returned with much more than just a few good thoughts to chew on. The conference theme was on having joy in the midst of opposition or persecution and was geared toward pastors, but wives and women’s ministry leaders were welcomed. The three-day event (translate “marathon”) began with four pre-conference tracks, including one specifically for women. What does it mean to be a mentor, and am I qualified? Is there ever a time to take a break from ministry, and should I feel guilty for it? What is the role of women in ministry and church leadership? You couldn’t have found a more appropriate blend of topics and speakers for this room of a couple hundred women. In between sessions, I heard attendees expressing their struggles, frustrations, and questions to complete strangers, asking each other for advice and prayer. I came away with a profound sense of neediness and weariness weighing down the ladies in that room. The story I heard over and over was a lamenting of the lack of biblical literacy and expository teaching for women by women in their churches. They know something should be done about it, but the problem is, whether it’s from lack of formal training or from fears and insecurities, most women feel helpless and inadequate. They don’t know where to start or what women’s ministry should even look like. They’re looking for someone to step up and teach or lead and aren’t sure if they should be the one to do it. Here was a group of women who see the need and are desperately seeking hope and encouragement for the battles awaiting them back home. They were at a conference primarily for men (many of them with their husbands) because they share a gnawing hunger for the Word and a strong desire to see the women in their churches and communities hunger for it, too. It was in this breakout session when I realized why God had me at this conference—it wasn’t simply to drink from the gushing fountain for my own quenching, but to be filled to overflowing in order to be poured out for others. Then it struck me anew how true this is for all of life, not just during a three-day conference. By God’s grace, this introvert slowly emerged from her shell and began ministering to ladies, talking to strangers, and listening to their stories. That’s a huge feat for me! Now I’m not naïve enough to think that my one little conversation with someone will solve all their problems. I don’t have it all together and don’t pretend to know all the answers, but I have Jesus and He is enough. In a later plenary session, Pastor Jason Meyer painted a beautiful picture of this concept of weakness, using the imagery of a jar of clay as mentioned in 2 Corinthians 4. If we were perfect pots without any blemishes or cracks, we would conceal the light of Christ that’s inside us. So it is as broken jars of clay that God uses us, because it is in broken jars of clay that God’s glory shines out through us. What makes this illustration so beautiful is that it is the essence of the gospel story. Jesus gave up His position in heaven and oneness with the Father to come to earth as a humble servant to man. He embraced weakness, became human flesh, and conquered death, creating a backdrop for the dazzling display of the glory of God. When you look around in your church or community, do you see the great need? Do you see weak and weary women in search of hope and strength? Do you count yourself in that category? As Jen Wilkin reminded us in her talk, when you want to address a problem or issue, don’t just talk about it; be willing to be a part of the solution. Maybe you’re one who has tirelessly given of yourself in ministry for your precious sisters. If you have, first of all let me say thank you! And second, if and when you feel the need for rest, don’t send yourself on a guilt trip. There are appropriate times and seasons for rest and solitude for which you shouldn’t feel ashamed. Jen Wilkin calls it “intentional laziness.” Don’t confuse recharging with giving up. Even Jesus got away from the crowds at times to be alone with His Father in quiet refreshment. But for those of us on active duty, take that step of faith and be a “friend-tor” to a woman (or two!) in your life. For you single ladies, don’t wait until you’re married to begin. And for you married ladies, don’t wait until you’re an empty nester or retired. Start now. Seize opportunities to invest in others and point them to the Source of strength through the enabling power of the Holy Spirit. Ladies, we need to pull out the Word of God and dig in. Be with Jesus. Drink from the fountain of Living Water, and then share your abundant treasure with another thirsty soul. Embrace weakness so that Christ may shine brighter in you. Don’t let inadequacies or fear of failure stop you. When you take your eyes off Jesus is when you succumb to fear. So fix your eyes on Jesus, the Author and Finisher of your faith, the Source of strength, the Living Water. He will enable you with His grace and satisfy you with His never-ending love. Messages from this conference are now available in audio and video format on the Desiring God website. 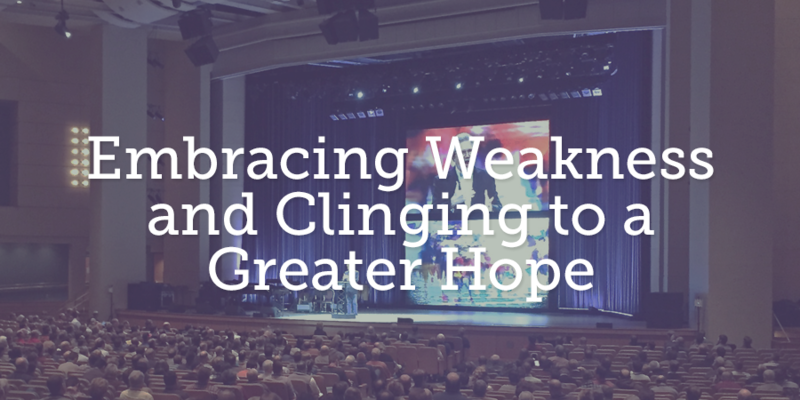 Embracing Weakness and Clinging to a Greater Hope was originally published on ReviveOurHearts.com.